Make easy finger puppets with a paper cone body and an attached paper head. 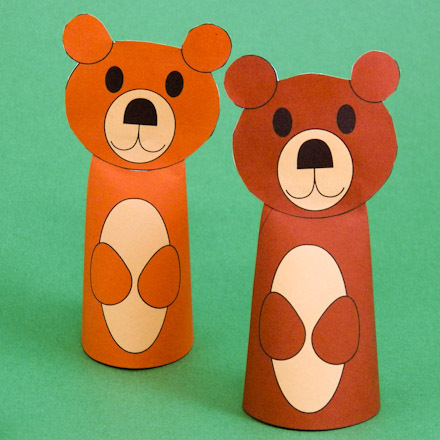 These puppets are simple and especially suited to a classroom setting. 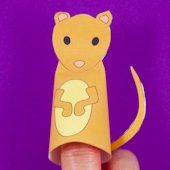 Make several finger puppets, then put on a play that features them. The play in this project, Officer of Heaven, is based on a folktale from western China. 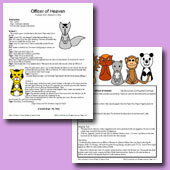 This project includes printable patterns for the play's characters and ideas for staging the play. Once you make the puppets in this project, use your creativity to make puppets of your own design. Just change the decorations and the shape of the head to make a new character. 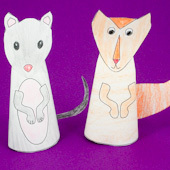 This is the fifth in a series of puppet-making projects that includes puppet plays based on folktales from cultures around the world and back in time. A Chinese folktale is the basis for a play, Officer of Heaven, using puppets in this project. Choose the puppets that you want to make. 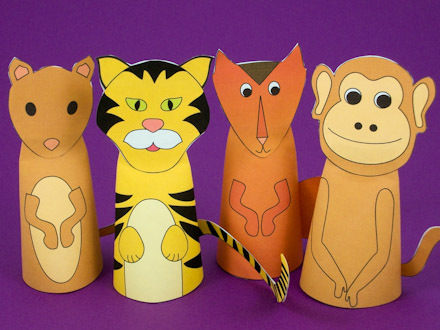 Make all the puppets for the play included in this project, or create a play of your own centered around the puppets you make. Each pattern includes the pieces to make two puppets, usually in different colors. 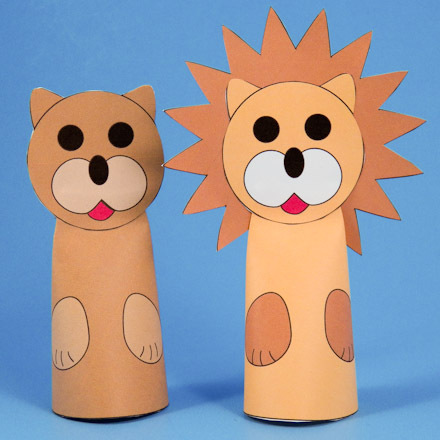 The lion pattern includes both lion and lioness puppets. 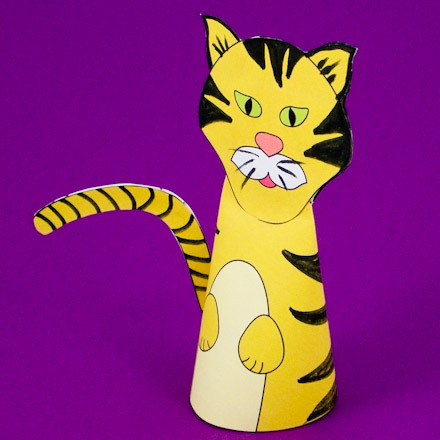 The tiger pattern includes striped and un-striped versions of the tiger puppet so you can draw stripes of your own design on the unstriped version. 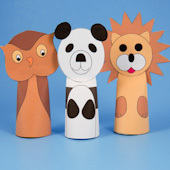 Select a B&W (black and white) pattern to decorate the puppets using your own ideas. Each puppet has a colored and B&W (black and white) pattern. For the most creativity, use the B&W patterns and color the puppet parts any way you	like—use your imagination. You can also add details on the already colored patterns—maybe some whiskers, ear tufts, spots or stripes. Cut out the cone body, head (front and back), and tail (front and back) for the puppet. Not all puppets have a tail. Wrap the cone body piece into a cone shape. Apply glue to the glue tab and on the inside of one edge. Press glue tab and edge together to form the cone. Pinch the top of the cone together and glue. Apply glue inside the top with a toothpick or small paintbrush. Glue the puppet's head to the top of the cone. First glue the front (face) of the head to the front of the cone, then glue the back of the head to the cone back. Carefully align the two head pieces. If any white shows around the head, either trim it away or color it to match the head. Lion and lioness: Glue the lioness head like other puppets. For the lion, glue the mane to the back of the head with the colored side facing to the front. Color the back of the mane, if you like. For puppets with tails, glue the tail front and back together, or color both sides of one tail cutout. Glue the tail to the back of the cone on either side. To use the puppet, place the cone on a finger. 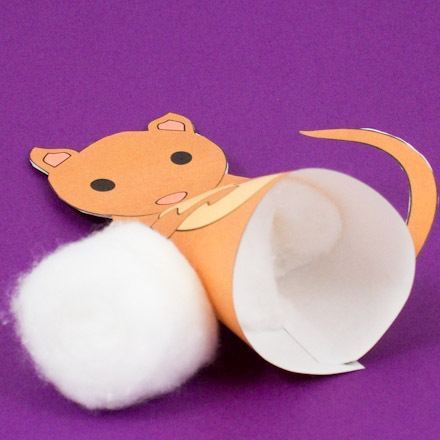 If needed, loosely stuff the cone body with cotton, fiberfill or other stuffing material so it fits your finger snugly. Puppet Play: Perform the play included in the project, Officer of Heaven. A folktale from western China is presented in the play that features the puppets in this project. Or you can come up with your own ideas. Think of what your puppets will do. Where does your play take place? Write down what the puppets will say and figure out how they will move. Once you decide upon the play, think about the staging. Will more than two puppets be on stage at once? Do you need a friend to help? Rehearse your play a few times, and then perform it for family and friends. That's it! Your puppets are done! Now put on a play! 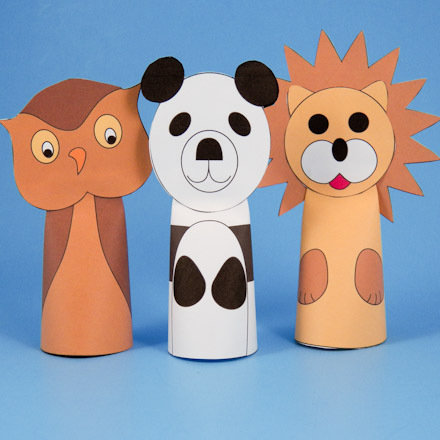 Tip: The project features printable patterns for eight different animal puppets, including the pictured owl, panda bear, lion and brown bear puppets. Make all the animals or just a few. Tip: For the un-striped tiger pattern, get ideas for drawing stripes by looking at pictures of real tigers. Tip: For the most creativity color the black&white patterns. You can pick any colors you want, and add a fur-like look by using the side of your crayon. 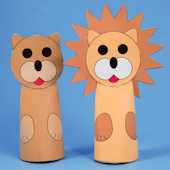 Tip: With the lion pattern you can make a lion and a lioness or two lions. Tip: To operate the puppet, place one finger inside the cone body. If your fingers are small, use two fingers. Tip: For a snug fit on your finger, loosely stuff the cone body with cotton.